why ask that there has to be something else?”. within us that can live forever. that life is vastly beyond time and space. The universe is wonderful, contingent, a womb. Your language makes no sense. 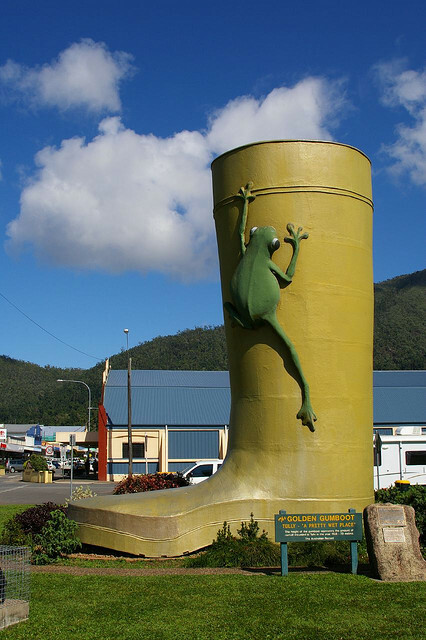 Tully has one of the highest rainfalls in Australia so built a giant gumboot with a frog as its icon. In the immediate aftermath of the devastating Cyclone Yasi in the Tully area, North Queensland, June Perkins took to documenting the story of resilience of the people around her. In the process of this documentation, June was one of the people activating resilience-building activities for the community. The stories she tells in “After Yasi – Finding the Smile Within” are simple, almost pedestrian, and so are, in style, a commentary on the paradox of an ordinariness of the community spirit that seems quite extraordinary. These straightforward stories shine a light on the vulnerability of people who have had their lives turned on their heads in one day of environmental violence. The poems that people wrote for the book are similarly simple and authentic, a sharing of lives finding their way out of the struggle to making it work again. Throughout June’s photography captures both the devastation and the recovery, and, in the recovery, the beauty and the friendships. Having an interest in contemporary dance, I particularly appreciated that one of the recovery events that June documented was a dance workshop run by local dancer Danielle Wilson. Contemporary dance is still a less well-developed community art form in Australia, so it was great to see it working for the community in resilience building. When the world shows us that, rather than being stable and faithful, it can be unstable and fickle, it often attacks the very core of our identity. In that attack, the body and mind can need the experience of revisiting the feeling of the event and the aftermath. Often it can be difficult to express in words what is showing up for the body. Facilitated contemporary dance can allow the mind to honor what the body is expressing and then generating a new story, a new future as a reconstituted identity and self-assurance. Contemporary dance also brings bodies and minds together, so that the sharing of experience and a new future with others, restores faith in that our true stability and support and our tomorrow is in the people around us. 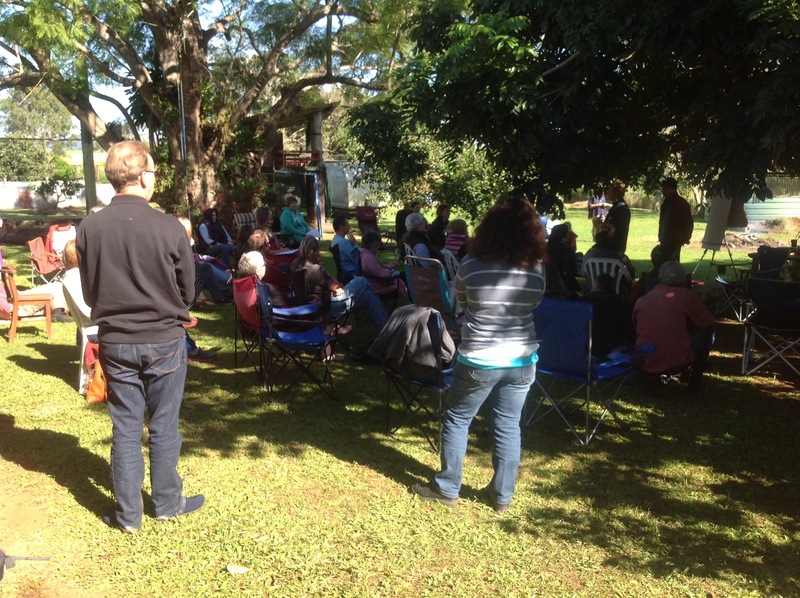 A few weeks ago I had the benefit of joining a weekend workshop on relationships, organised by several local people, none with any particular expertise, most coming from following various schools of personal growth. The hallmark of that weekend was, not the professionalism but the adult communication and vulnerable nature of the work. The group might be defined as people who want to make a different world, a new world, a peaceful world, a respectful world, in praxis more than oration. And this waa amply achieved. Myself, I put aside intellectual arguments I might have thought of about certain techniques of understanding our health. And, even if my argument was right, perhaps the health of all is achieved by not resisting the exploration of something unusual, just because it is unusual. I wonder, ‘Is this love?’, allowing that everything is unusual, and that it is okay that something seems unusual, and okay for that something to exist as unusual and exist as a relationship, as acceptable. The workshop provided an opportunity to write a poem through a facilitation of a word web about relationship and human reality. 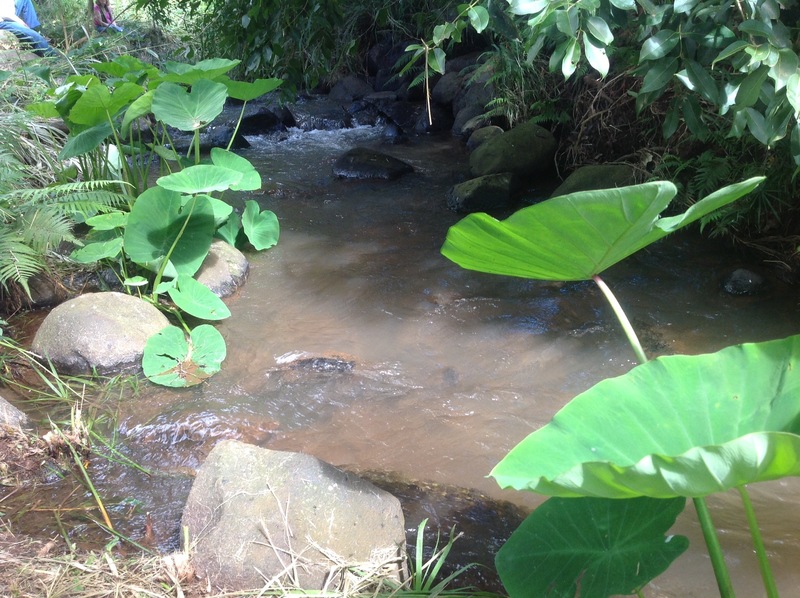 My poem constructed itself from a reverie of observations by a creek that ran through the property. gathering to rush out again. from withing each cascading moment. Last year (2013), I had the privilege to attend two wonderful national events in the arts: The Inaugural DANscienCE Festival in Canberra hosted by the CSIRO Discovery Centre; and the 5th International Arts and Health Conference in Sydney. The DANscienCE Festival in August 2013 was eight (8) days of presentations and demonstrations of: the science of dance; scientific ideas that can speak to dance and movement art; and dance speaking for science. Dance with ecological and ornithological themes; dance as sociological research tools; dance for healthy ageing; fluid dynamics; cognitive studies; and dancer’s health. I was asked to sit on a physiotherapy panel for an evening of presentations from 6 dance genres: ballet, hip hop, belly dance, hindu dance, african and contemporary (over 50s). The evening was, professionally, a great experience, especially as my co-panellist, Roz Penfold has previously held jobs with the Australian Triathlon Team and Australian Ballet. Evidence to that evening’s success, Glen Murray of MADEinTasmania, Australia’s best over 50s contemporary dance company, reported that he was using ideas from our discussion in his classes. The most ironical presentation of the week came from Deakin University’s Movement Studio who revealed that the Playstation NRL game was animated from the actions of dancers who can represent rugby moves better than rugby players (except the crunching tackles). 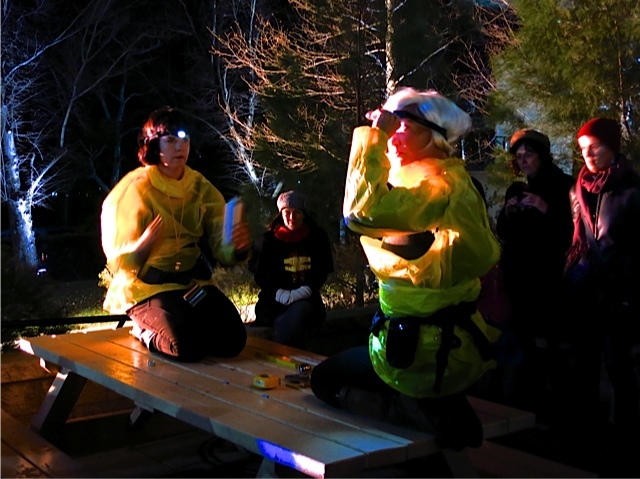 As I now post this report, I am putting my support behind Liz Lea of Canberra Dance Theatre and organiser of the 2013 DANscienCE Festival, to organise another DANscienCE in 2015. The International Arts and Health Conference focused on: creative ageing and mental health, which found me in workshops with Circus Mojo from the USA and clown doctor GP Mark Spitzer, Dancing with Poetry in the NSW Art gallery (among the Nolan’s); writing for resilience with Molly Carlille, palliative care manager; discussions on the design of nursing homes for happiness; conversations with the David Cutler,CEO Baring Foundation UK, Dominic Campbell Director Irish Beltaine Festival; UK Churchill fellow Paula Turner; Angela Lion of Arts Fusion, Singapore;and many delegates who brought a wealth of experience and aspiration to the place of the arts in the health industry, hospitals, and community well-being. The conference coincided with public support from Federal Health Minister, the Hon Peter Dutton MP, and his State and Territory counterparts, who endorsed a National Arts and Health Framework that was initiated by the Standing Council of Health Ministers in November 2011. As Federal and State Governments realize that there are not the resources to care for ageing ‘baby boomers’ unless there is a far greater increase in health and community support for the older person, it is becoming clear that the arts have a HUGE contribution to make in all areas of health interventions and a healthy life.